Le Loft de la Tour - Château de Goult, Gordes.Luberon, Provence. 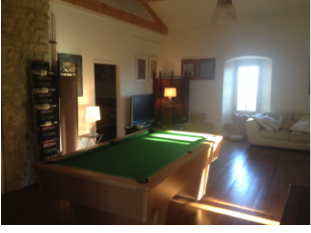 "Le Loft de la Tour"
Located on the ground floor between the Clock Tower and the Castle, it offers all the facilities of an independent apartment outside the castle itself. The 100m2 open space offers a comfortable living area with a DVD system and a pool table as well as a fully equipped kitchen. 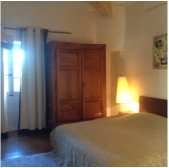 The Tower's Loft has a double bedroom with its own bathroom, and a possibility to sleep an additional 4 guests. 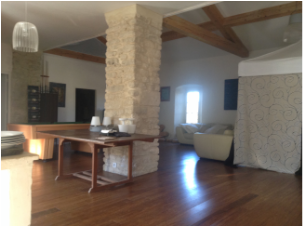 The Loft can be rented separately but only when the castle is not occupied.